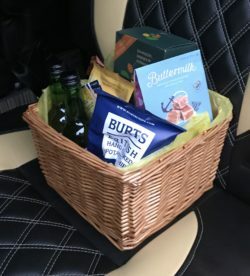 Campervan hire from Moovans comes with lots of lovely extra touches and that includes our welcome basket full of goodies from Somerset, Devon and Cornwall, showcasing the best produce in the West. Get your hands on one of our lovely West Country Gourmet baskets. Includes Dorset Cereals, Miles Tea, Buttermilk Fudge, Burts Chips and Orchard Pig juices. Simply hop over to our Facebook page, like us and follow us on Twitter. We’ll pick the lucky winner 31st May 2018.